JJC F-CPL Ultra-Thin Circular Polarizer Filter helps to reduce reflections and glare by filtering out light that has become polarized due to reflection from a non-metallic surface such as water and glass. This results in a noticeable increase in the saturation of skies and foliage, as well as clearer imagery when photographing in hazy condition. The effect can be seen through the viewfinder and changed by rotating the filter. The filter factor varies according to how the filter is rotated and its orientation to the sun. 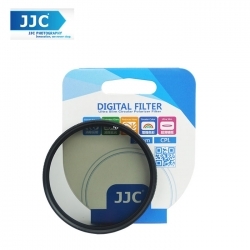 This filter is constructed from optical glass for maintained image quality and is set in a precision milled aluminum filter frame. The ultra thin frame measures 4.78mm-thick and its slim design helps to minimize the likelihood of vignetting.